The goal of IntelliMagic Vision is to identify potential issues before they impact applications. This is achieved by an intelligent rating system where workload measurements are combined and compared with the capabilities of the systems. 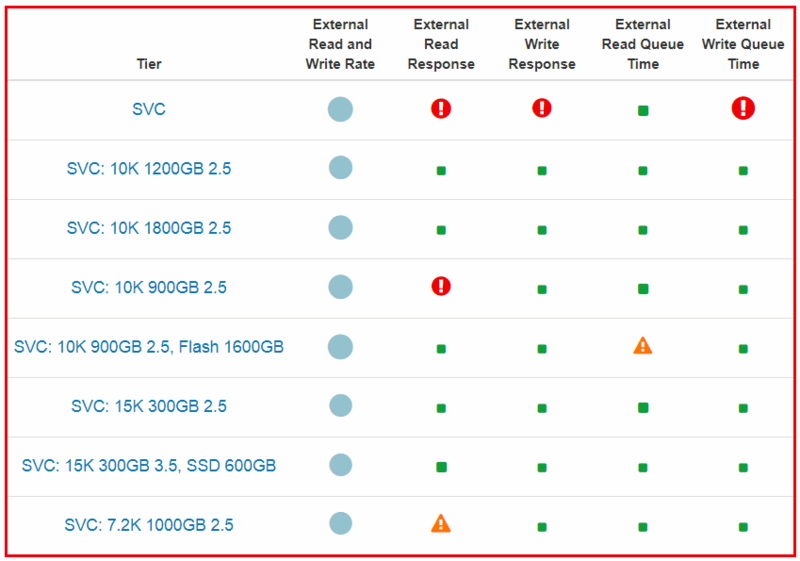 The resulting ratings are shown in dashboards that represent the health of your SAN Storage and Switches. There are separate dashboards for the storage systems, for virtualization engines such as IBM Spectrum Virtualize (SVC), and for the Fibre switches. The dashboard indicates infrastructure health by showing the key ratings for that part of the environment. Dashboard ratings are based on the analysis of thousands of underlying data points, making the dashboards a very dense summary of hundreds of charts. The result is that issues and risks are flagged proactively, before application performance degrades. Watch the video below for an in-depth look at our Dashboards and Ratings. red bubble – indicates more severe risks or issues. With these visual cues, it is extremely easy to see the health status of the entire environment at a glance. IntelliMagic Vision can be set up to send emails automatically when a dashboard contains one or more yellow or red warnings. The bubble dashboard shown above provides the most compact view, but the rating is actually based on a very detailed level of analysis. To get more information about an issue, you can click on the bubble to get to the next level of detail, where the bubbles are replaced by mini charts that show the metrics over time, as well as the rating and threshold values. Each individual chart contains multiple drill-down options to go to the deepest level of detail in any direction. 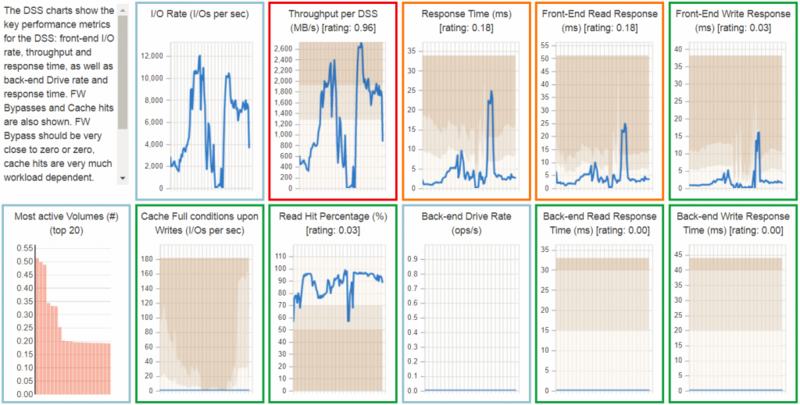 For example, to find the cause of the large red circle for back-end write response time in the highest level dashboard. There are thousands of pre-defined charts and reports available in IntelliMagic Vision, grouped into logical sets. If you are interested to show a combination of metrics or filters that is not available out of the box, you can customize the charts that are there, or define your own from scratch and add it to your favorite chart set. The thresholds that are used in the rating system are also customizable to fit your situation. All charts and reports can be exported to CSV, HTML, PDF, Powerpoint and Splunk. This chart shows immediately that there is an imbalance between the I/O groups: the first one carries the majority of the workload. Often the aggregate throughput of a SAN storage system’s front-end (host) adapter is less than the sum of the individual ports. Unfortunately, most tools do not report the cumulative throughput or I/O rates for an entire front-end adapter. IntelliMagic automatically computes the sum of the key metrics for all Fibre ports on a given front-end adapter to provide the utilization of the adapters.